Nine albums, three film scores, Grammy and Latin Grammy nominations, multiple awards, works recorded in Deutsche Grammophon, five continents toured and four college degrees (three in music) are some of the career milestones of Alvaro Paiva-Bimbo, a passionate scholar of the Art of Music and a deep lover of Art and knowledge in general. His mastery and versatility have also served the most diverse worldwide artists: score for Amazon series “Patriot”, feature film “Buddy Games” and internationally awarded novel “Liubliana”; play guitar for superstar Becky G, music legend Aldemaro Romero and “The prince of salsa” Luis Enrique; produce for multi-awarded funk band Los Amigos Invisibles, latin jazz percussionist Luisito Quintero (Chick Corea, Richard Bona) and hit maker Servando Primera; orchestrate for rock star Alejandra Guzmán, world- renowned Simon Bolivar Orchestra, and indie figure Esteman; write for classic trumpet figure Pacho Flores; conduct for pop stars Natalia Lafourcade and Ximena Sariñana; record with jazz virtuosi Anat Cohen and Luis Perdomo; arrange and direct shows with Latin Grammy winners Ilan Chester, La vida bohéme, Ralph Irizarry, María Teresa Chacín, Guaco, etc. Born in Caracas from a Venezuelan/Italian family of teachers, Alvaro recently relocated to Los Angeles, California. 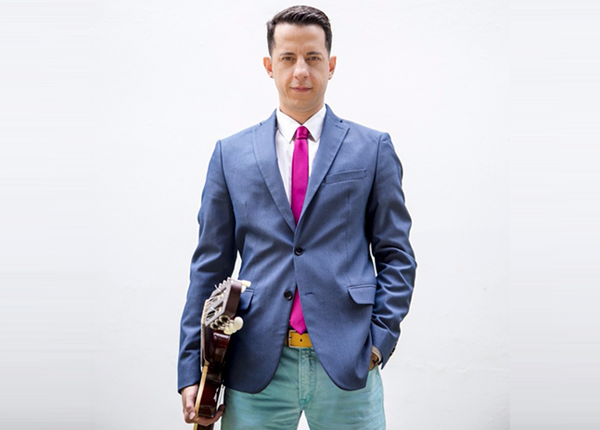 He is signed with Universal Music Publishing Group MX; is a member of ASCAP, The SCL, NARAS & LARAS; and part of Godin Guitars, Ultimate Ears, MONO Cases and Tech21· NYC artist families. Instruments: Guitar, Bass, Ukelele, Piano, Songwriting, Composition.